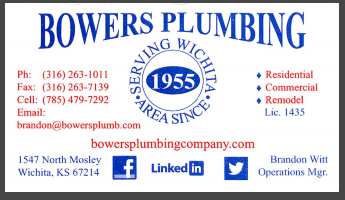 Bowers Plumbing | Matthew Rupp | Wichita, KS. My name is Matthew Rupp and I help my clients with marketing their businesses online. Having been an entrepreneur for the last 22 years, I pay a LOT of attention to things like this. In all my experiences with customer service, I only have two examples where I was genuinely blown away. The first example was years ago when I was attending a conference in Washington, D.C. with some friends from different parts of the country. We did a bus tour to see some of the sights and saw the White House, the Washington Monument, the Lincoln Memorial amongst other sites. 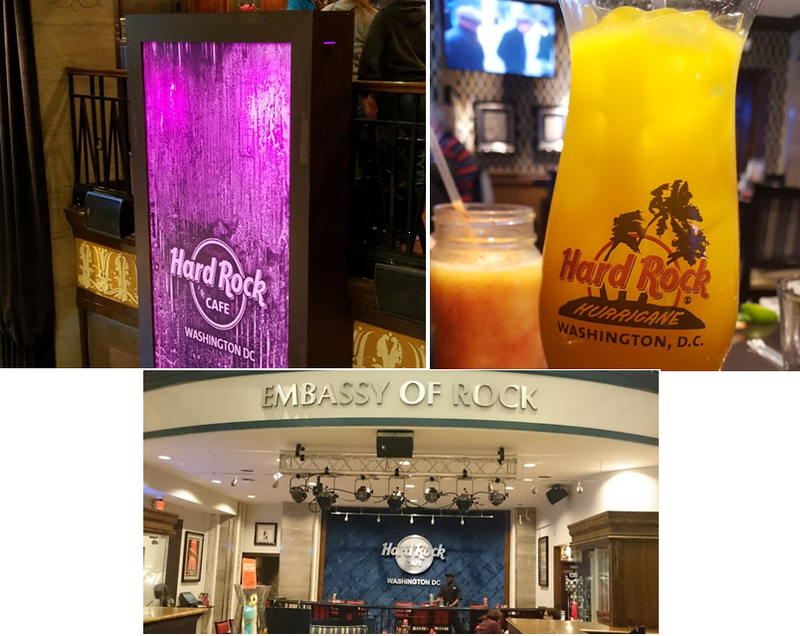 The weather was nice, so we ended up walking and, on my advice, we decided to eat dinner at the Hard Rock Café. Being from Wichita, KS and having accumulated a few souveniers from different locations around the country, I thought it would be a cool experience. For whatever reason, the restaurant was short staffed and especially busy that night. We knew we’d shown up at a super busy time, but our initial wait time was not the problem. Throughout the whole meal the service was poor; drinks were empty and wait times were long. The food was good, but the overall experience was really disappointing, especially to me, since I was the one who had suggested going there. Normally I am not one to complain, but the terrible service coupled with how little the server seemed to care bothered me enough that I asked to speak to the manager. I expressed my disappointment, explaining that we were from out of town, only there for a couple nights, and could have gone anywhere. We had chosen to eat there, and we were incredibly disappointed in our experience. The manager listened, not once getting defensive or interrupting me—a wise tactic on his part, as very often all unhappy customers want is to feel heard by someone who cares). When I finished listing our complaints, the manager asked what he could do to make it right. I explained that I wasn’t complaining to try to get anything free; I just wanted to express my concerns. He asked again, “Is there anything I can do to make this right with you?” I reassured him that getting something in return wasn’t my goal and told him I appreciated him listening to me and caring. “Let me see what I can do,” he said. “I’ll be right back.” A couple minutes later, he returned and comped the entire meal for all six of us—the appetizers, the entrées, all the drinks, everything. On top of that, he gave every person at the table a gift card for a free drink, appetizer, and entrée to use at a later visit. So not only did we pay nothing for a meal that should have cost hundreds of dollars, but we also left with gifts cards easily totaling another $300. On one hand, that was a costly way to make the situation right, but think of the goodwill his gesture created. The manager took what was a genuinely poor experience—one that might have lost the Hard Rock Café six customers and resulted in some negative reviews—and turned it into a positive experience we would talk about to potentially dozens of people for years to come. That happened almost TWENTY YEARS AGO and I‘ve probably told the story 100 times to different groups of individuals. More recently, I had another noteworthy experience (on a much smaller scale) with a local company right here in Wichita. As I mentioned before, I do digital marketing for my clients, which means I help make their phones ring by putting their websites to work. 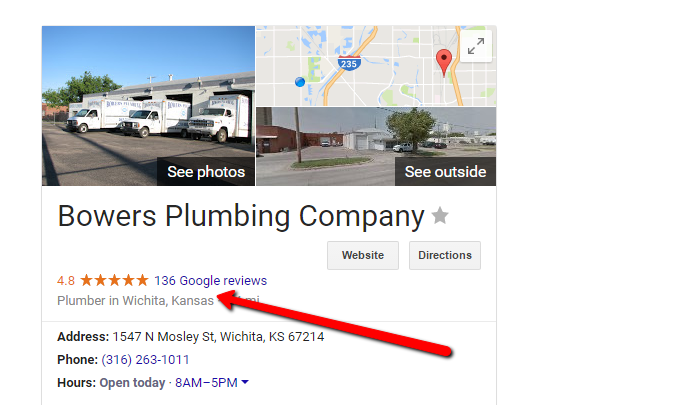 I have a pest control company I love working with and I just just started working with a great HVAC company here in Wichita, but I don’t have a plumber yet to help make #1 on Google. I like working with market leaders, independent family businesses that have built a name for themselves. I know they clearly want to grow their business because I see their billboards around town. Their website and online presence could be a lot stronger. I wanted to know what was behind 136 reviews and 4.8 stars on Google. That is REALLY impressive. 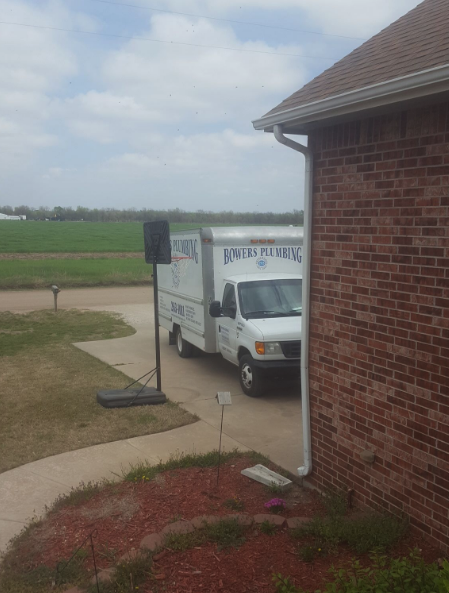 So I created this post for them: How Bowers Plumbing could increase their sales by 100% over the next 12 months. I have created case studies like this a number of times, often as a “gift” to help demonstrate to a company that I really can help grow their business and am not just one of those fly-by-night companies claiming to be able to make them #1 on Google tomorrow. I spoke with Brandon, the operation manager at Bowers Plumbing, a few weeks ago, but they are super busy and the website isn’t a really high priority right now, which I understand. After that, I was busy hiring a new project manager, so it was a couple of weeks before I was able to put together a second post for them. This one is about backlinks and why they matter when it comes to ranking well on Google: One more way I could make Bowers Plumbing #1 on Google. In the middle of wrapping up that second post, following up with Brandon, and hiring my new employee, I had an actual plumbing issue at home. There was a problem in our downstairs bathroom, used by our three boys (ages 18 ,12, and 10). I tried to fix it myself over the course of the next few days and had no success. After three days of the boys using the upstairs “guest” bathroom, my wife had had enough. She told me my days of being a part-time plumber were over and it was time to call a company. I thought this would be a perfect opportunity to see what it’s like doing business with Bowers Plumbing. Maybe I would gain some insight into how they were getting SO MANY glowing reviews on Google. Was there some kind of incentive or discount offered in exchange for leaving a review? It never once occurred to me that maybe they got THAT many reviews just by offering truly superior service, standing behind what they say, and doing the right thing. Is that sad or what!? Anyway, when I called and made an appointment, I asked what I should expect to spend. I was told the service charge for coming out was $100 and there was a very good chance that’s what it would cost me. Of course, if the plumber determined that the situation was worse than we hoped or thought, it could end up costing a LOT more than that, but chances were the $100 service charge would cover it. Even with that information, I honestly expected the bill to be much higher; I had really put some time and work into it already, and I did not think it would be an easy fix. On the day before the appointment, Bowers called to confirm the time, which was helpful but nothing out of the ordinary. The plumber did show up on time and got right to work. He clearly knew what he was doing and didn’t expect it to take very long to fix. He had the problem fixed in probably less than two minutes. I don’t recall his name, but he said he had 30 years of experience. He went above and beyond, explaining to me what likely caused the problem, how to keep it from happening in the future, and where to go (The Tap here in Wichita) instead of the big box stores and why. When he gave me my bill, the total was $139.05. Honestly I was so happy it wasn’t a terrible problem that would cost hundreds of dollars to fix, I was happy to spend the $139. I did mention to him that when I scheduled the appointment, I was told it would be $100, and I expected that we would discuss the cost if it wound up being more than that. He didn’t get defensive, but he said he didn’t know what we had discussed. He told me that he’d actually gone above and beyond fixing more than the original problem and that was the charge for what he did. No problem. I paid the bill and said thanks, and he left. If it weren’t for me wanting to work with the Bowers team, that very likely would have been the end of it. I would have gone on with my day and thought nothing of it. I was surprised that there was no effort made to encourage me to go online and leave a review for them on Google. no discount or coupon or incentive. How were they getting 136 shining reviews on Google!? My desire to see what was behind so many positive reviews was enough for me to call Bowers and express my concerns about the extra $39 I was charged. I explained I was thrilled it didn’t cost hundreds of dollars and it wasn’t a lot of money, but I wished it had been explained first. I was speaking to Brandon Witt, the operation manager there at Bowers Plumbing. What he said next could not have surprised me more. He offered to send that extra amount I was charged in the mail that day. WHO DOES THAT ANYMORE? Not a moment’s hesitation. “As the Operations manager and the one you spoke to that was my responsibility and I apologize”. It is so rare these days to see a company doing what is right simply because it’s the right thing to do and is how they SHOULD treat their customers! It was a letter from Brandon. Not just a typed note or a form letter—a handwritten note in which he takes responsibility and apologizes. So, now I know how they got so many incredible reviews on Google, such a strong and loyal customer following, and a good name in the community. Before this, I thought it would be awesome to work with a plumbing company here in Wichita because helping highly competitive service businesses put their websites to work is what I’m good at. 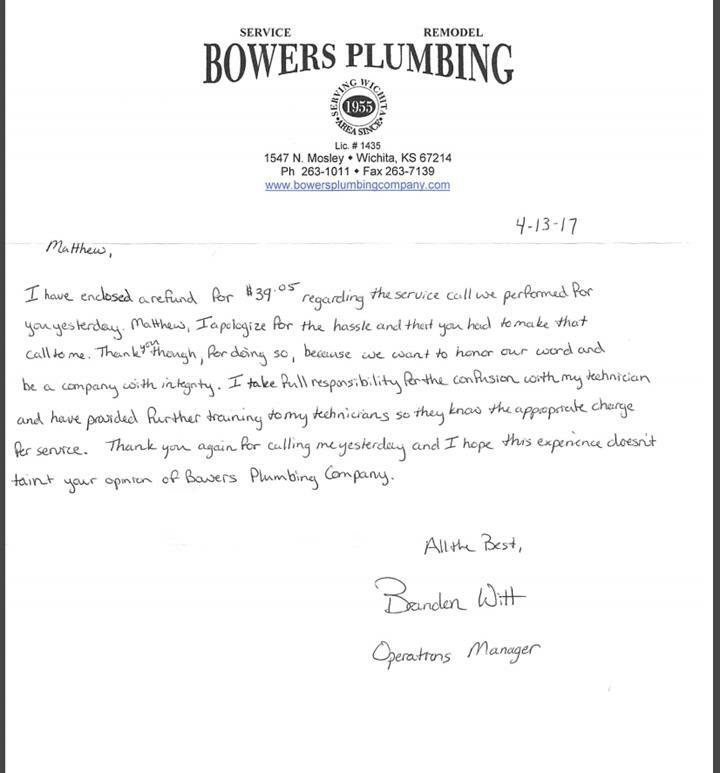 To be honest, if I didn’t end up working with Bowers, I would have been happy to help any plumbing company in Wichita (except once I am hired by one company in that industry I won’t work with anybody else). But now, after my experience with Bowers, I REALLY want to work with them and only them! These two posts are just two (easy) ways I could put your website to work. How Bowers Plumbing could increase their sales by 100% over the next 12 months. I have about 89 more strategies just like these (and better) I would love to share with you. You can reach me at localseo@matthewrupp.com if you would like to chat.